Alluring gray wood accented by metal. Product Description Polished Debut. 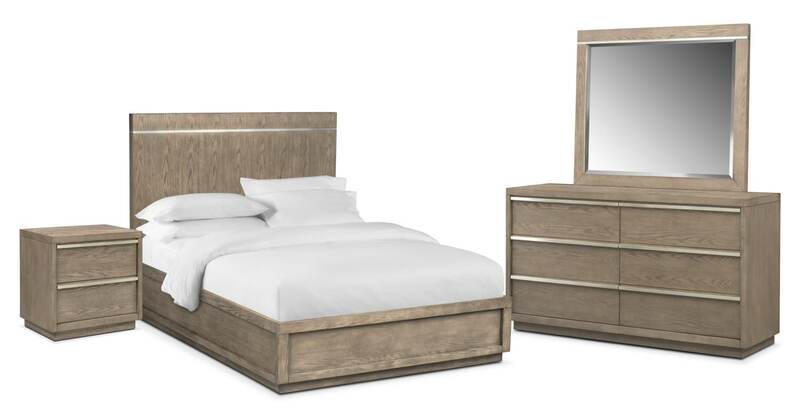 Blending modern design elements with an art deco feel, the Gavin bedroom collection adds brilliance to any bedroom space. Featuring a soothing graystone finish with gorgeous brushed chrome detailing, this set perfectly fits in with sophisticated and contemporary décor. Ample space in each complementary storage piece keeps extra linens and clothing tucked away, while minute details like stained interior drawers make this collection truly exceptional. Customer assembly required. Unique Features: Beautiful wood grains showcased in a peaceful graystone finish. Simple panel bed silhouette fits contemporary and minimalist décors. Brushed chrome hardware accents the headboard for a mid-century modern appeal. Ample storage provides space for clothing or extra linens. Open top shelf and concealed bottom drawer provide the nightstand with diverse storage options. Dresser features antique metal insets, adding a vintage feel to this modern piece.